Why Does CO2 Escape From An Enclosure More Easily Than Air? so I'll post his response to my previous comment on his behalf. If my understanding is flawed again then please put me straight. If I understand correctly then can you explain the difference between a balloon that has been punctured with numerous tiny holes (let’s say 10nm diameter each) and one that naturally has numerous tiny pores (let's say 0.33nm) as a result of being blown up and the latex stretched? Michegan State University Chemistry Department provides a spacefill model (which you can zoom into) of the molecular structure of latex [urlhttp://www2.chemistry.msu.edu/faculty/reusch/VirtTxtJml/lipidstr2.htm#rubber/url]. This tells me that there are tiny air spaces between the fabric (a matrix of C and H atoms? With no mention of anything else, like water) which must grow larger as the fabric is stretched (as in blowing up a balloon). At some stage the spaces must become large enough to let through any trapped gas inside, like He or CO2. Firstly, the space-filling model of molecular structure shown in Prof Reusch's website is intended to show how the polymer molecules are put together in terms of the relationships and bonding of individual atoms in the molecular chain. What the model shows is the structure of a small section of an individual chain. It repeats at the purple atoms, and a single molecule of latex would typically contain between about 1000 and 10000 of these repetitions, and they do not run in a straight line. Secondly this one molecule is fairly tightly packed in laterally with parts of chains of other molecules. In a polymer of this sort the packing cannot be perfect; there are always holes. But these are randomly sized and shaped sealed cells, not open channels (unless the rubber is perished or damaged). Thirdly, there is no way that the tiny gaps you see are "air spaces". Any of the molecules in air are about the size of two of the dark grey carbon atoms, and there is no way that they would fit in the tiny gaps you are seeing in the model. Fourthly, when you stretch rubber, you are not producing a regular expansion of the molecular structure. You are not stretching the chemical bonds between atoms nor even opening out the bond angles from their natural 110-120 degrees closer to a 180 degree straight line. Rather, you are actually partly unravelling a tangled series of random chain coils into a more extended chain -- a lot like trying to pull a tangle of ropes apart. Surprisingly, even some chemists in the rubber industry are not aware of this! If you would really like to find out about how polymers work -- rubbery polymers, glassy polymers, and crystalline polymers -- I thoroughly recommend a book (a little old by now, like me) by Leo Mandelkern: "An Introduction to Macromolecules". It is an accessible and e-n-j-o-y-able read even for an intelligent layman. Dr. Christie, thanks very much for another very helpful comment. PS: I see that the problem was the spam detector picking up on the word "e-n-j-o-y-able" minus the -. Argh. Am getting very fed up of this spam filter. Have now added enjoyable to enjoy, enjoyed and enjoyment on the whitelist! Hi Rosy, yes, it can be a little frustrating at times, can't it, especially because it does not make it clear to a newcomer what the problem is. After 17 days the situation was no different and I was tempted to terminate it, guessing that the reason might be that the balloons were coloured (not natural as on previous tests) and perhaps the die/colouring reduced the size of pores in the latex or was preventing the CO2 dissolving. I was about to terminate the experiment because my wife had complained about the tape measure I’d stuck to the floor to get the balloon diameter when I noticed that the CO2 balloon looked a lot smaller than the other and sure enough it has suddenly started to deflate. It was down to 350mm and half an hour later it was at 300mm v the original 440mm while the air one is at 420mm v 450mm. I tested the CO2 balloon in waterwhen it was at 300mm and saw no bubbles escaping through any leak but an hour later it is down to 230mm but still no sign of a leak when immersed in water. Have any of the experts here any idea why there would be that delayed response and what is causing this sudden collapse? - Dr. Christie, please help. Regarding Dr. Christie’s response of 14th June @ 19:13 it looks as though the preferential escape of CO2 v other atmospheric gases from a latex enclosure may be a different process to that covering the escape of CO2 from air pockets in ice. On the other hand, Dr. Zbiniew Jaworowski has discussed in several of his numerous papers how liquid water exists in deep ice. I propose to take a look at his ideas again and comment on them in the hopes of getting some further assistance here on that . I’ll first have a look at an article that I hadn’t come across until now “Doing Jaworowski justice” (http://www.greenworldtrust.org.uk/Forum/phpBB2/viewtopic.php?t=116&sid=502c043eca9509535498780bbd11b74f) because the exchanges between Ferdinand Engelbeen and Lucy Skywalker are it is along the same lines as Pete Ridley’s exchanges with others on “Another Hockey Stick Illusion?” (http://www.thenakedscientists.com/forum/index.php?topic=38675.0). Talking about Lucy Skywalker (anyone have any information about her?) she posted an interesting guest post “Yamal treering proxy temperature reconstructions don’t match local thermometer records” (http://wattsupwiththat.com/2009/10/30/yamal-treering-proxy-temperature-reconstructions-dont-match-local-thermometer-records/) relating to Michal Mann’s original “hockey stick”. “Warmist” treering proxy temperature evidence is falsified directly by local thermometer records”. (1) Balloon latex does not follow Hooke's law. It is very stretchy at low pressures (low Young's modulus is the technical term) but much less so at higher pressures, almost rigid. What I think you might be seeing is a steady reduction in pressure in the CO2 balloon, but no discernible change in diameter while it remained effectively fully inflated. (2) This effect is compounded with the fact that a reduction in volume of gas contained in a balloon is not commensurate with an equivalent change in diameter. If you observed a halved diameter, then the volume is only one eighth of what it was. There are peaks and valleys, with concentrations ranging from about 190 to 290 ppm. If CO2 had migrated through the ice, structure like this would necessarily be wiped out. Hi John (damocles) thanks for having a stab at explaining that sudden collapse of the balloon with ½ CO2 and ½ air. It’s now down to 200mm diameter from the original 440mm while the air-filled one remains at 430mm (down from 450mm). Perhaps it is worth mentioning that the original (uncoloured) balloon that I filled with air about a month ago is still fully inflated. Hi John (damocles) thanks for having a stab at explaining that sudden collapse of the balloon with ½ CO2 and ½ air. It’s now down to 200mm diameter from the original 440mm while the air-filled one remains at 430mm (down from 450mm). Perhaps it is worth mentioning that the original (uncoloured) balloon that I filled with air about a month ago is still fully inflated. I propose to re-use those same balloons but swop around the CO2 and air to try to rule out a difference in each balloon’s properties. .. meltwater seeps down and collect over impermeable layers. The firn density gradually increases with depth and at .83 g/cm3, firn changes into solid ice in which all pores are occluded, forming the primary air bubbles. Between a depth of 900 to 1,200m air bubbles disappear. Liquid water is contained in quasi-infinite network of capillary veins and films between the ice crystals. .. He goes on to talk extensively about liquid water in the ice, e.g. .. liquid water is present in ice even at very low temperatures, and because many chemical and physical processes occur, in situ, in ice sheets and in recovered ice cores. These factors, discussed in References 8, 12, 22, and 24-28, change the original composition of air entrapped in ice, making the ice core results unrepresentative of the original chemical composition of the ancient atmosphere ..
.. (2) No liquid phase occurs in firn and ice at average annual air temperatures of 224°C or less ..
these assumptions are incorrect, and thus that the conclusions on low pre-industrial levels of atmospheric greenhouse gases are wrong . I think that none of us has a definite molecular level understanding of the physical process occurring at close-off ..
(http://www.thenakedscientists.com/forum/index.php?topic=38675.msg354373#msg354373). If we can for the moment make the assumption that Jaworowski is correct about that water in firn (and there are plenty who say that he is wrong) what effect do you think that would have on the movement of CO2 within the firn and ice? -- The persistence of the sharp variations over periods of less than 1 kyr in the Vostok record is solid proof that the CO2 has NOT moved, because if it had moved, the only thing it could have done would be to have smoothed out these variations. The peaks would have had to flow into the troughs. -- The detail of presence of liquid water or not, or fancy notions about diffusion mechanisms and bubble formation mechanisms and so on are therefore totally irrelevant. Jaworowski may or may not be right in the detail of some or all of what he has to say. It does not alter the fact that there is 100% solid proof in the ice record that the CO2 has moved less than 1 kyr through the profile in the whole lifetime of the ice sheet. Hi John, thanks for the prompt response. .. intrigued with the idea of a Hickey Stick ..
As I understand it this is what the global mean atmospheric CO2 content during the past 1000 years is claimed to be by the paleoclimatologists using measurements of air “trapped” in ice. .. can only move from regions of higher concentration to lower concentration ..
.. sharp variations over periods of less than 1 kyr in the Vostok record ..
.. The detail of presence of liquid water or not, or fancy notions about diffusion mechanisms and bubble formation mechanisms and so on ..
.. that there is 100% solid proof in the ice record that the CO2 has moved less than 1 kyr through the profile in the whole lifetime of the ice sheet ..
be more opinion than fact? .. Prof. Jaworowski's main argument is valid and will remain valid because it is based on simple, but hard physicochemical facts. Most of the facts can be found in the old, traditional "Gmelin's Handbook of Inorganic Chemistry” - but nobody reads such books anymore today. The facts are so basic that one cannot even start a research project on an investigation of the validity of such carbon dioxide analyses in ice cores because the referees would judge it too trivial. But if one would apply proper quality assurance/quality control principles, as they are common in most other areas of application of chemical-analytical methods (for instance in drug control or toxicology) the whole building of climate change would collapse because of the overlooked fault. 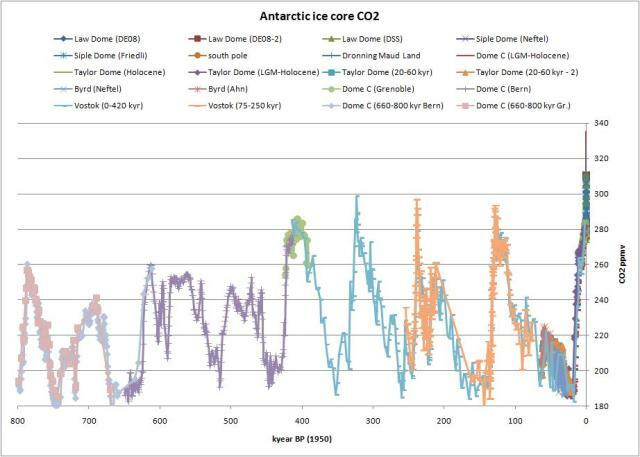 still exist if the original CO2 concentration was much much higher than the level shown in the ice core record if the rate of migration was very very slow? Could not a slow rate of migration still leave residual peaks and troughs as seen from that record? No, they definitely could not still exist; those sharp features would necessarily be the first to disappear of there were any migration of CO2 at all. It only involves a few kyr of migration through the record to wipe them out, one kyr to completely blunt them. CO2 trapped in ice has not moved. Of course, not being a scientist I could be totally wrong, but Jaworowski and his supporter Professor Hartmut Frank are scientists, the latter being highly regarded by his peers. No disrespect to Professor Hartmut Frank, but "Ecotoxicology" points to a background in Organic Chemistrry and Medical Chemistry, which is a very different specialization to Glaciology or Atmospheric Chemistry/Physics. It is disingenuous to trot out credentials like this when you are prepared to ignore the credentials of a huge consensus of Atmospheric Scientists who have views that do not fit in with your preconceived notions. ... And (unless I hear much more effective refutation), here endeth the topic as far as I am concerned. Evidence has been presented to me confirming that the user "Pete Ridley" has, by his own admission, been using the false name "Yelder" to participate in this forum, referring to his own previous posts as though they were those of a third party; this is despite being asked previously to leave, and subseqently banned, owing to his repeated failure to abide by our forum rules and acceptable user policy. Wantonly providing false personal information on the forum in this way is not acceptable. For this reason, Mr Pete Ridley's alias "Yelder" has also been banned and renamed (for the benefit of other forum users) to make it clear that this content is also the work of Mr Pete Ridley. Furthermore, having run its course and been thoroughly discussed, this thread has now been locked; thank you to everyone who has contributed to it. What is a vaccine escape and low reactor vaccine isolate? If I jump before a falling lift hits the ground, will I escape injury? If gravity travels at the speed of light, how does it escape a black hole? Page created in 0.212 seconds with 57 queries.